How to access iPhone photos instantly on PC after you taking photos with your iOS device? How to upload Windows pictures to various iCloud devices wirelessly? The answer is iCloud My Photo Stream, a wireless and immediate way for you to view most recently taken and uploaded photos on platforms. So, this article will teach you how to download iCloud Photo Stream to PC plus user guides and a solution to My Photo Stream not working on PC. How to Transfer Photos When iCloud Photo Stream not Working? ✔ Convert Live Photos to MOV videos and still images. What is iCloud My Photo Stream? iCloud My Photo Stream is a great feature Apple promotes to help people transfer and backup photos wirelessly among various platforms with iCloud on them. When you turn on My Photo Stream on iPhone or iPad, it will automatically upload recent iOS photos you shoot and send them to all of your iCloud devices when connected to WiFi. And when you enable My Photo Stream on PC, you are able to download photos from iPhone to PC or upload pictures from computer to iCloud devices wirelessly. iCloud Photo Stream doesn't occupy any iCloud storage space but it only uploads up to 1000 pictures in the last 30 days. Apple has reminded you officially that My Photo Stream not working on PC may happen if you recently created your Apple ID. 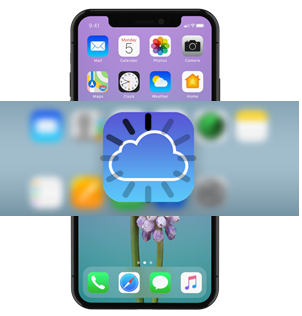 Under such circumstance, you can enable iCloud Photo Library on PC and iPhone to upload photo library to let yourself access photos and videos from all of your iCloud devices. How to Download iCloud Photo Stream to PC Windows? Step 1: Download & install iCloud on Your Windows PC. Go to https://support.apple.com/en-us/HT204283 iCloud for Windows official download page, click on download to free download iCloud, then install and launch it on your PC. Step 2: Sign in iCloud to Use My Photo Stream on PC. Click on Sign In to log in with your Apple ID and password to start downloading and uploading photos. Step 3: Enable iCloud Photo Stream on PC. On the main interface of iCloud for Windows, click on Options next to Photos and check My Photo Stream. * To download new photos from iCloud My Photo Stream to PC, you should check "Download new photos to my PC" under My Photo Stream. You are also allowed to change the folder to save the downloads. * To upload photos from Windows to My Photo Stream, you should first check "Upload new photos from my PC" > click the Windows Start button to choose Pictures > select iCloud Photos > Upload photos > select the photos you want to add to iCloud My Photo Stream and then click Open. Of course, you can change the Upload folder at will. After that, remember to click on "Apply" on the main UI to start downloading or uploading photos on Windows PC. iCloud My Photo Stream not Working on PC? How to Solve? 1. iCloud My Photo Stream won't work temporarily as iCloud isn't working for Windows 10. In October, Windows 10 had released its new version v1809 update, but the incompatibility between the new Windows and iCloud causes iCloud not working for Windows 10. Thus, Windows 10 users can't use iCloud Photo Stream until the problem is resolved. To download iCloud photo stream to PC from an iPhone or view Windows pictures on the iPhone, you'd better use the same Apple ID to log in on both sides. 3. Please turn on iCloud My Photo Stream on your devices. Just give an example. If you want to share and sync photos between iPhone and Windows PC through iCloud Photo Stream, you have to turn on My Photo Stream both on iPhone and Windows PC. On iPhone: Go to Settings > iCloud > Photos > turn on "Upload to My Photo Stream". On Windows: Click on Options next to Photos in iCloud > check My Photo Stream as well as the Download and Upload options. 4. Make sure the WiFi is stable and strong. WiFi is a must-have for uploading and downloading photos through iCloud My Photo Stream. 5. Ensure the battery power is enough on device. If the battery power is below 20%, iCloud My Photo Stream will automatically stop working to save the battery life. So, make sure there is enough battery power. 6. Turn off the Camera app. When you leave the Camera app, iCloud My Photo Stream on PC and iPhone iPad will start auto syncing photos. 7. iCloud My Photo Stream supports limited image formats. My Photo Stream on Windows PC or iPhone iPad could only upload JPEG, PNG, TIFF and most RAW photos, while GIF or Live Photos are not supported. If you want, you can convert Live Photo to still JPG image to upload. 8. iCloud Photo Stream on PC and iPhone has limited upload numbers. My Photo Stream will only store your recent 1000 photos last 30 days. For pure sync functionality, you can only upload up to 1000 images per hour, 10,000 per day, or 25,000 per month. So, My Photo Stream not working on PC or iPhone occurs when the number of your photos exceeds that number. 9. The edited photos won't sync via iCloud Photo Stream. iCloud Photo Stream can't keep all the edits up to date across devices, so you may have to switch to other ways when you need to transfer edited photos from iPhone to PC or uploaded edited photos to the cloud. 10. Manually check "Upload Burst Photos". If you take iPhone photos with burst mode or image stabilization, only the photos you select as favorites can be added to iCloud My Photo Stream. To make all burst-mode photos be uploaded, you can go to Settings > [your name] > iCloud > Photos > turn on "Upload Burst Photos", and then all of your burst photos will be uploaded. 11. My Photo Stream turns off automatically. If you turn on iCloud Photo Library on your PC, My Photo Stream on PC will turn off automatically. So, turn it back on in iCloud Photo Options if you want to send new photos on PC. How to Transfer Photos between iOS and Windows PC without iCloud? If there is no WiFi or Ethernet for iCloud Photo Stream to sync photos among devices, or if My Photo Stream not working issue has exhausted your patience, how can you sync photos between iPhone and PC or other platforms? You can use DearMob iPhone Manager. Step 1. Download DearMob iPhone Manager on Windows PC, install and launch it. Step 2. USB-connect your iPhone or iPad to computer, tap "Trust This Computer" to continue if there is a popup message on your device. Step 3. Once connected, click on "Photo Transfer" on the main UI of this software. 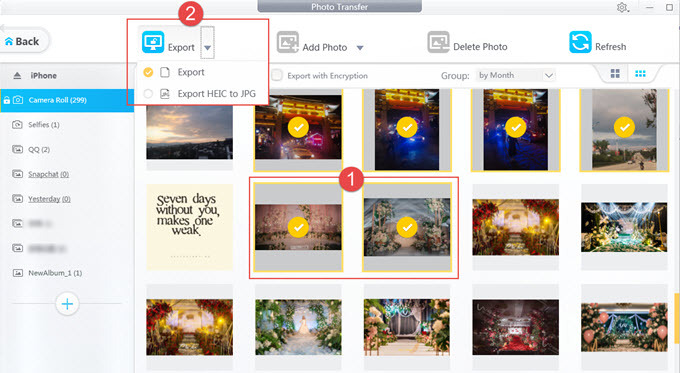 Then, choose the photos you want to transfer from iPhone iPad to Windows computer and click on Export. Step 4. Create a new album by clicking the "+" button in the left bar, and then you are allowed to import pictures from PC to iPhone iPad by clicking on the "Add Photo" icon. Please remember to click on Sync. No WiFi required and no need to remember the complex Apple ID and password, DearMob iPhone Manager allows you transfer any number of photos in JPG, JPEG, PNG, GIF, BMP and TIFF without restrictions between iOS and computer. Also, both Live Photo and edited photos that can't be handled by iCloud Photo Stream could be transferred with both the original and edited files remained. If you have any private or sensitive photos, you can also use this iPhone photo manager to password-protect photos with military standard. How to Solve iPhone DCIM Folder not Showing on Computer? How to iCloud Backup Taking Forever, Days, Hours?